Dr. Rosenkrantz was born and raised in New York City. He graduated from the City University of New York with a Bachelor’s in Psychology and minor in Biology. "My family (and my sister's family) have been patients of Dr. Rosenkrantz for at least 15 years. He and his staff are all terrific. My son--who is now 12--actually likes going to the dentist because of the friendliness (and humor!) of Dr. Rosenkrantz and of everyone in the office. 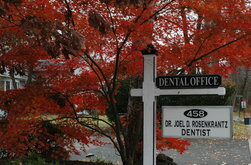 Dr. Rosenkrantz has handled all dental procedures--routine and more complicated--expertly. I highly recommend him." "I have been under Dr. Rosenkrantz's care for over 7 years. I have had fillings, crowns and implants done by him. I have never experienced complications or pain. Dr. Rosenkrantz is always attentive and provides the most viable solution and he always considers cost and benefits. He is calm and very thorough, spending extra time to finish the treatment to perfection. His profession is his passion which is why I would highly recommend Dr. Rosenkrantz. I thank him and his office staff for exceptional work and friendliness.